There was an earthquake in Burma today! The epicenter plotted very close to the Sagaing fault (SF), a major dextral (right-lateral) strike-slip fault system, part of the plate boundary between the India and Eurasia plates. This fault system accommodates much of the dextral relative movement between these two plates. I initially thought this would be a strike-slip earthquake. However, the USGS fault plane solution (moment tensor, read more about them below) shows that this was a thrust (compressional) earthquake. There is a region of uplift to the west of the SF, where there is a fold and thrust belt (the Bago-Yoma Range). This region may be experiencing compression due to the relative plate motion here and the orientation of the SF (strain partitioning). There is a GPS rate map below that shows geodetic motion oblique to the SF, showing compression. There were two M 7.2 and M 7.4 earthquakes just to the southeast in 1930 and an earthquake in 1994. The 1994 earthquake was a dextral strike-slip earthquake, but the 1930 earthquakes are too old to have this type of analytical results on the USGS website (see Sloan et al., 2017 figure below for the M 7.3 1930 earthquake, which shows a strike-slip mechanism). I plot the USGS fault plane solutions (moment tensors in blue and focal mechanisms in orange) for the M 6.0 earthquake, in addition to some relevant historic earthquakes. In the upper left corner, is a map from Maurin and Rangin (2009) that shows the regional tectonics at a regional scale. The Sunda Trench is formed along the Sumatra-Andaman subduction zone, where the India plate subducts beneath the Eurasia, Burma, and Sunda plates. The Sagaing fault is the right-lateral strike-slip plate boundary fault between the Burma and Sunda plates. The black arrows show the relative plate motions between the India : Sunda and India : Burma plates. The Sagaing fault links with the Sumatra fault via the Andaman spreading ridge system. I place a blue star in the general location of today’s earthquake sequence. To the right of the Maurin and Rangin (2009) map is a map from Wang et al (2014) that shows how the Sangaing fault can be broken up into segments. Warm colors are higher elevation than cooler colors. Other than national boundaries, red and black lines represent faults. I place a blue star in the general location of today’s earthquake sequence. In the lower left corner is a figure from Sloan et al. (2017) that shows the fault systems here along with the GPS derived plate motions. On the left, we can see the triangle-barbed red lines, which are ~north-south striking thrust faults in the Indo-Burmese Wedge (“Ranges” on the map). I place a blue star in the general location of today’s earthquake sequence. In the lower right corner is a large scale view of the earthquake faults and historic seismicity of this region (Wang et al., 2014). These authors also plotted some moment tensor data for historic earthquakes. I place a blue star in the general location of today’s earthquake sequence. 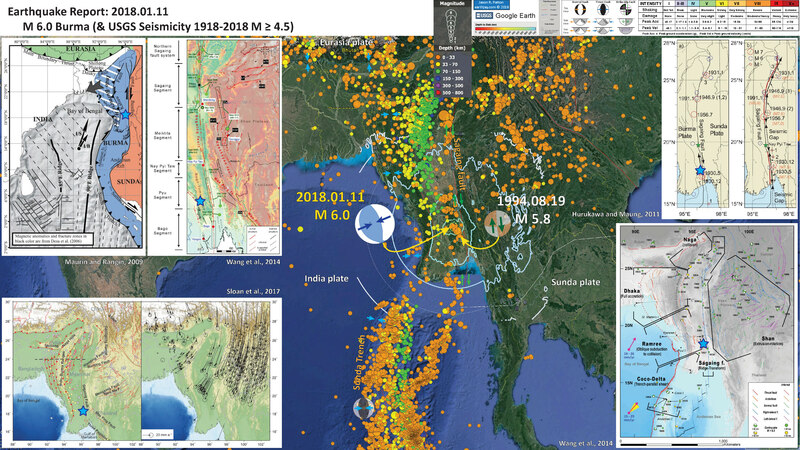 In the upper right corner is a map showing historic earthquakes on the Sagaing fault (Hurukawa and Maung, 2011). The right panel shows where the authors hypothesize that there is a seismic gap north of 20 degrees latitude, north of where this M 6.0 earthquake happened. I place a blue star in the general location of today’s earthquake sequence. Here is the same map for USGS historic seismicity for earthquakes M ≥ 4.5. This map shows nicely how seismicity gets deeper to the east along the Sumatra-Andaman subduction zone (the Sunda Trench) along the southern part of the poster. This also shows how seismicity also deepens to the east along the Indo-Burmese we3dge (IBW), which is the convergent plate boundary system to the west of the SF. Here is a different cross section that shows how Maurin and Rangin (2009) interpret this plate boundary to have an oblique sense of motion (it is a subduction zone with some strike slip motion). Typically, these different senses of motion would be partitioned into different fault systems (read about forearc sliver faults, like the Sumatra fault. I mention this in my report about the earthquakes in the Andaman Sea from 2015.07.02). This cross section is further to the south than the one on the interpretation map above. I include their figure caption as a blockquote below. This figure shows the interpretation from Maurin and Rangin (2009) about how the margin has evolved over the past 10 Ma. Cartoon showing the tectonic evolution of the Indo-Burmese Wedge from late Miocene to present. Here is the map showing the SF fault segments (Wang et al., 2014). Fault segments and historical earthquakes along the central and southern parts of the Sagaing fault. Green dots show relocated epicenters from Hurukawa and Phyo Maung Maung . Dashed and solid gray boxes surround segments of the fault that ruptured in historical events. NTf = Nanting fault; Lf = Lashio fault; KMf = Kyaukme fault; PYf = Pingdaya fault; TGf = Taunggyi fault. Tectonic map of part of the northeastern Indian Ocean. Modified from Curray (1991). Here is the Sloan et al. (2017) map showing the faults and GPS derived plate motion. Seismotectonic map of Myanmar (Burma) and surroundings. Faults are from Taylor & Yin (2009) with minor additions and adjustments. GPS vectors show velocities relative to a fixed India from Vernant et al. (2014), Gahalaut et al. (2013), Maurin et al. (2010) and Gan et al. (2007). Coloured circles indicateMw > 5 earthquakes from the EHB catalogue. Grey events are listed for depths <50 km, yellow for depths of 50–100 km and red for depths >100 km. The band of yellow and red earthquakes beneath the Indo-Burman Ranges represents the Burma Seismic Zone. The dashed black line shows the line of the cross-section in Figure 2.13. ASRR, Ailao Shan–Red River Shear Zone. Here is a Sloan et al. (2017) map that shows fault plane solutions (including the 1930 M 7.3 SF earthquake) for earthquakes in the region. Seismotectonic map of Myanmar (Burma). Faults are from Taylor & Yin (2009) with minor additions and adjustments. GPS vectors show velocities relative to a fixed Eurasia from Maurin et al. (2010). Slip rate estimates on the Sagaing Fault are given in blue and are from a, Bertrand et al. (1998); b, Vigny et al. (2003); c, Maurin et al. (2010); and d, Wang et al. (2011). Major earthquakes (Ms ≥7) are shown by yellow stars for the period 1900–76 from International Seismological Centre (2011) and by red stars for the period 1836–1900 from Le Dain et al. (1984). The location and magnitude of theMb 7.5 1946 earthquake is taken from Hurukawa&Maung Maung (2011). Earthquake focal mechanisms are taken from the GCMT catalogue (Ekström et al. 2005) and show Mw ≥5.5 earthquakes, listed as being shallower than 30 km in the period 1976–2014. IR, Irrawaddy River; CR, Chindwin River; HV, Hukawng Valley; UKS, Upper Kachin State; SF, Sagaing Fault; KF, Koma Fault. The inset panel is an enlargement of the area within the dashed grey box. It shows the dense GPS network in this area. This map shows that the region where today’s M 6.0 earthquake is located is in the region of uplifted regions along the SF. Here is a comprehensive map showing the complicated tectonics of this region (Sloan et al., 2017). Regional tectonic setting of the Andaman Sea Region modified from Morley (2017). See text for explanation of labels A–E. The locations of Figures 2.15– 2.17 are indicated. This map shows how Rangin (2017) hypothesizes about the platelets formed along the plate boundary. Extension of the Burma–Andaman–Sumatra microplate (shown in green). The Burma Platelet is the northern part in Myanmar. Active faults are shown in red and inactive faults in purple. The post-Santonian magnetic anomalies and associated transform faults of the Indian and Australian plates are suggested in blue. Left-lateral red arrows along the 90° E Ridge illustrate left-lateral motion between the Indian and Australian plates. India/Eurasia relative motion is shown with a yellow arrow, India/Sunda motion with purple arrows and Australia/Sunda motion with black arrows (modified from Rangin 2016). This is a great summary figure from Ranging (2017) showing how these plates and platelets interact in this region. Structural map of the active buckling of the Burma Platelet considered not to be rigid. The curved Sagaing Fault, Lelong, Kaladan and coastal faults outline this arched platelet. WSW extrusion of the platelet is outlined by the NE–SW diffuse dextral shear south of the South Assam Shear Zone into the north and by the left lateral Pyay-Prome shear zone in the south. The western margin (CSM: collapsing Sunda margin) of this platelet is affected by dextral wrench and active collapse of the continental margin, but no sign of active subduction was found. This platelet is bracketed tectonically between the drifted 90° E Ridge and the accreted volcanic ridges into the south and the Eurasian Buttress (Himalayas and Shillong) into the north. The East Himalaya Crustal Flow (EHCF; large curved red arrow) imaged in the East Himalaya Syntaxis (EHS) is induced by the Tibet Plateau collapse and could be an important component of the tectonic force causing the platelet buckling. The Burma Platelet is jammed between the Accreted Volcanic Ridges in the south, and the Shillong Plateau crustal block in the north, participate to the buckling of the Myanmar Platelet. BBacc, Bay of Bengal attenuated continental crust (Rangin & Sibuet 2017); CMB, Central Myanmar Basins; CMF, Churachandpur-Mao Fault (Gahalaut et al. 2013). 2 Responses to Earthquake Report: Burma! Thank to read ur paper of Pyu Earthquake. I study earthquake history of Myanmar. When I read your report , I get many knowledge .